Plain white sugar is what I typically use for sweetening my fruit cobblers, crumbles and crisps. Not only is it a staple ingredient that I always have in my pantry, but it doesn’t have much flavor on its own and really allows the flavor of the fruit to shine through in the finished dessert. You can’t go wrong with it. 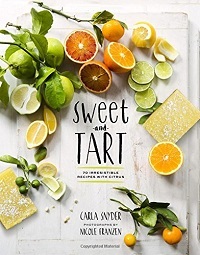 That said, it isn’t the only option for sweetening a fruit dessert and ingredients like honey, maple syrup and brown sugar can bring new complexity to an old favorite recipe. 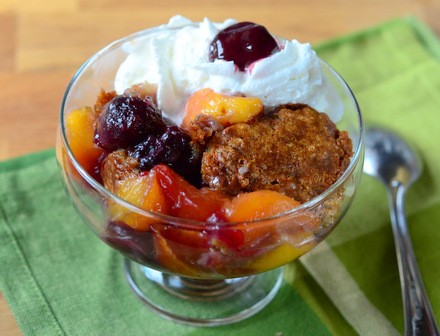 This Brown Sugar Cobbler with Nectarines & Cherries has a topping that is made with buttermilk and brown sugar sitting on top of a fruit filling that is also sweetened with brown sugar. Brown sugar has a note of rich molasses in it that enriches the flavor of the fruit in your filling. It also contributes a nice color to the topping, yielding a dessert that has a dark golden top. When it comes to the sugar in this recipe, I recommend using a light or golden brown sugar for the topping. I find that dark brown sugar calls out for a bit of spice to compliment it, so I prefer to use it with fillings of apples and pears, with a touch of cinnamon in the mix. You can use this topping with a wide variety of different fruits, using them in the same proportion as the nectarines and cherries in the recipe below. 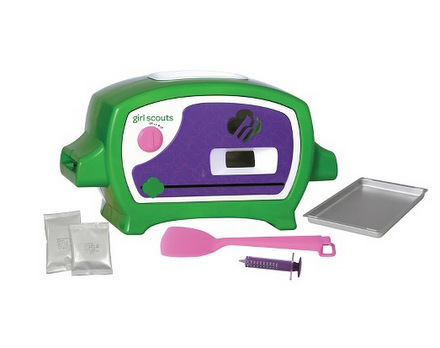 Play around with the sugars in the filling to see how the different combinations work. While I love the brown sugar topping, I still prefer white sugar with light, floral fruit fillings (mangoes and white nectarines), but find that brown sugar adds a lot to cherries, berries and other stone fruits. Serve this dessert as-is or top it off with a scoop of vanilla ice cream. I like a small dollop of whipped cream, if I’m dressing mine up. You can serve as many as 8 with this recipe, but I won’t blame you if you decide to (like me) be a lot more generous with your servings. Preheat oven to 350F. Take out a 9-inch square baking dish. Prepare the filling: Combine nectarines, cherries, sugar, cornstarch and vanilla in a large bowl. Toss to combine and transfer to the 9-inch square pan. Prepare the topping: In a large bowl, combine flour, brown sugar, baking soda and salt, then whisk to combine. Add in butter and toss to coat the pieces with the flour mixture. Rub butter in with your fingertips or a pastry cutter until the mixture is sandy. Combine buttermilk and vanilla in a measuring cup. Add to flour mixture and stir with a fork until the batter comes together. Drop dollops of batter on top of the fruit mixture. Bake for 45-55 minutes, until the fruit filling is bubbling and the topping is a dark golden color. Allow cobbler to cool for at least 20 minutes before serving. What a great looking combination! Stumbled upon this… Where did you purchase the frozen peaches & Cherries? They look amazing! Thanks! Frozen peaches and cherries are available at most grocery stores in my area. These particular fruits came from Trader Joe’s.